I agree with the need for this feature, but on the flip side, shows that I'm watching but have been on for a long time (e.g. The Daily Show) don't always show up in my progress page because I've watched a relatively small percentage of the show (I imagine this is why). Having the ability to mark which shows I'm currently watching would solve both problems. What I'm looking for is an app that that can help me organize my screening process. If I decide not to go forward, I'd like to be able to see a list of movies / shows that I haven't screened out. As a user, I should be able to mark shows as "not interested" and see those filtered out automatically from my the lists of possible movies, searches, etc. To recap my previous replies, you can hide shows by clicking the Ø icon when viewing your dashboard up next, progress page, or calendar. There is no need to unwatch the items. You can unhide from trakt.tv/settings/hidden if needed too. I was able to get things off my progress by searching for the show, clicking the "Watched History" purple check mark, then selecting "Remove All". I also think this is a great idea. It would help clean up my "progress" in exodus kodi. I have more than a few duds I'd like to get rid of. Yes, absolutely. Maybe not drop it off the radar completely but get it out of the 'must watch' list. this is what hannah posted: and its perfect for what i want! This is exactly what I've been looking for. The option to specify that I have seen however many episodes of a show, but chose to not continue watching it. For example, watching the pilot but not liking it enough to go any further (while still being marked down so I don't forget about it and try to watch the show again later). Or, as a better example: watching several seasons of a show and deciding that it has gone downhill and no longer having any desire to see the remaining episodes. Trakt continually reminds you that you still have X number of episodes to watch even when I don't want to watch them, I'd like to be able to mark them down as "crap I have no interest in any more so please stop showing them to me". I got the idea from myanimelist. 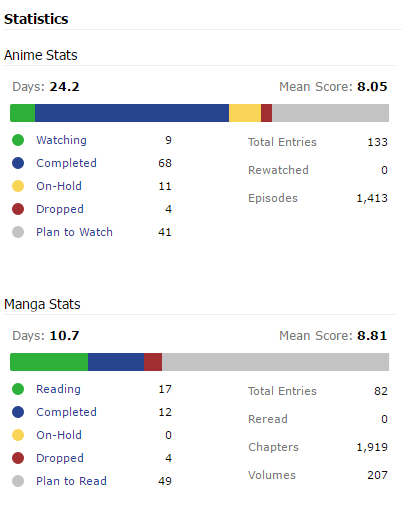 They have a cool way of showing your current status on shows and movies as seen in this picture. It'd be nice to have for a personal record. For instance, if I come across a show I dropped some time in the future, I can look and see that I dropped it instead of wondering why I didn't finish it and avoid wasting my time and interest.